The Refuge – A Healing Place is situated on 94 acres of the beautiful Ocala National Forest. This ideal Central Florida location is just an hour’s drive from Orlando. The surrounding greenery and serene environment helps the center in providing holistic healing to its clients. The center treats clients that suffer from post traumatic stress disorder, trauma, substance abuse issues, depression, co-occurring disorders and other addiction problems. The goal of The Refuge is not only to treat the physical symptoms but to provide complete healing of mind, body and spirit. This is achieved through programs of Detoxification, Residential Treatment, Relapse Prevention, Partial Hospitalization Programs and Alumni Support. Other therapies employed by the center include Individual Therapy, Group Therapy and 12-step programming. The staff at the Refuge constitutes an Executive Team, Medical Staff, Clinical Staff and Administrative Staff. Each member of the staff is highly qualified and experienced in their respective fields. Together, they are able to provide direction, guidance and safety to clients during their journey of healing and recovery. All the treatment programs and therapeutic approaches help clients to recover and maintain total wellbeing even after completion of their treatments. The Refuge offers treatment to patients in a dignified and honorable way. 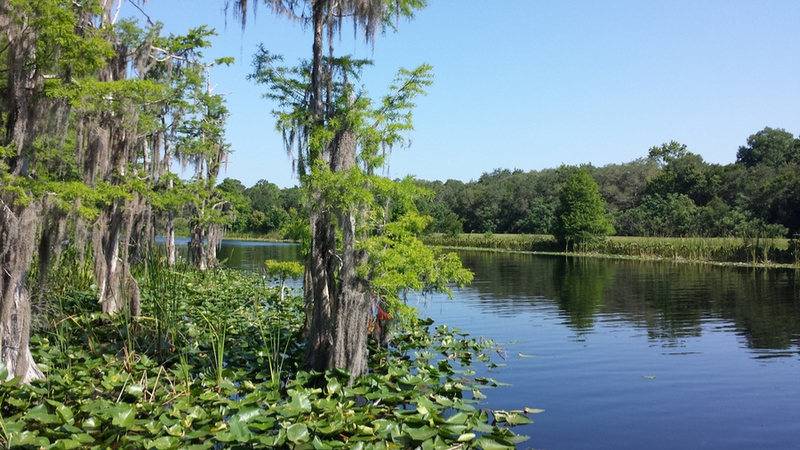 The Refuge is situated on a beautiful land in the Ocala National Forest. It is surrounded by pine trees and thick green beds of grass. The peaceful and serene environment of this 94-acres facility has a healing power which clients notice as soon as they enter. It helps them leave their worries behind and aids their healing process in a stress-free environment. Men and women patients are segregated for lodging. Patients stay in cabins which are shared among three members. The cabins are luxuriously furnished and decorated in such a way that it gives a comfortable and camp-like feel to patients. Clients enjoy amenities such as air-conditioning, shared dressers and closets. The Refuge takes advantage of the surrounding green habitat by conducting many outdoor activities and outdoor group sessions. Outdoor activities include bicycle riding, horseback riding, walks on the meditation trail, and the high-ropes course. Other outdoor recreational facilities include a swimming pool, volleyball court, basketball court, hiking trails, a labyrinth, and fishing dock. Indoor recreational activities are also encouraged. These include painting and table tennis. The center also has an indoor gym with an adequate variety of gym equipment. The Refuge has its own chef who serves meals thrice a day. The Refuge offers a variety of treatment programs and therapies. Cost of treatment is different for each client based on their individual treatment plans and modalities. Most of these options are covered by insurance. The Refuge accepts many insurance companies. The experienced staff at the admissions office assists clients in working out an insurance plan that best covers the cost of their treatment. The Refuge also offers healthcare loans through Prosper Healthcare Lending. The company offers several benefits with a loan such as fast & easy loan inquiry process, zero prepayment penalties, no collateral requirement, longer terms for lower monthly payments and 100% confidentiality. The Refuge – A Healing Place is a national treatment center that offers healing services to clients suffering from trauma, post traumatic stress disorder, depression, addiction and substance abuse. The motto of this facility is to Unravel (the trauma story), Understand (the eating disorder, addiction, and mental health story) and Create (the recovery story). The beautiful campus located in the Pristine National Forest and the aesthetically built lodging facilities provide clients with a warm, serene and secluded environment for healing and recovery. The treatment is personalized for each patient. The committed staff and physicians use experiential and traditional therapies to provide holistic treatment to its clients. Patients and families can directly approach the facility for assessment and admissions. The Refuge also accepts professional referrals from other centers and physicians. Using the clinical therapeutic approaches, the center is able to provide complete treatment of the mind, body and spirit. The Refuge was founded by Isabel Rehak and a few other members. In 2017, she was appointed the CEO of the Refuge. She has over 15 years of experience working with addiction and healing facilities. She has been a driving force in making continuous improvements to the facility and to move it in the right direction to better serve its clients. Her commitment and dedication plays a vital role in achieving the mission of the Refuge. Dr. Douglas Davies did his fellowship in Addiction Medicine and is board certified by The American Board of Addiction Medicine. His responsibilities at the Refuge include leading and supervising the medical staff. He also works part time at the Florida State University where he delivers lectures on topics of tobacco addiction and its physical, emotional and spiritual negative effects. He mentors and engages patients to help them on their road to healing and lasting recovery. Janina has a Master’s degree in Forensic Psychology from the Chicago School of Professional Psychology. She is a licensed Mental Health Counselor in the state of Florida. She has experience in providing mental health treatment and counseling to adolescents and adults. She has been counseling and assisting clients at the Refuge since 2011.